It's been a while since I've been able to take some landscape/coastal shots and I had been itching to get back out with my camera. My photo buddy, Willie, noticed that the weather report called for clouds on the coast on Thursday and we packed our camera gear and drove over an hour around the bay and over to Pescadero to stop at one of his favorite beach spots: Bean Hollow Beach. The last time he was here he stumbled upon a Dead Whale that had washed ashore! He managed to take this amazing photo before the crews arrived to bury it in the sand. When we arrived today you could still see part of its carcass above ground. I can officially say I've now touched a whale! We spent a while scouting out places to shoot and I couldn't really find anything I was happy with. 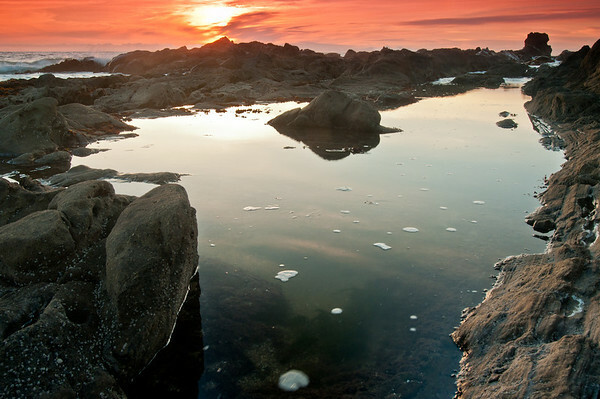 I had found a little tide-pool that I thought would be simple enough and might reflect the sunset colors. I setup my tripod and waited for sunset. The clouds were really far off and we kept praying they'd come closer and give us a beautiful sky -- sure enough we got a great sunset but once the sky lit up I realized my tide-pool was a pretty boring shot with lots of distractions. I decided to post this shot anyways, since it's "OK", and this was "the shot" that I decided I was going to go for during this photo shoot. As you can see, it's got a lot of distractions in the background and the round shape that I was going for is kinda masked away and looks fairly flat. Oh well, it was worth a shot Nikon D300s w/Nikkor 17-35mm f/2.8 ED-IF AF-S: 22mm, f/10, 1/6 sec, ISO 320, Tripod Lee Foundation Kit Filter Holder B+W F-Pro Circular Polarizer, HiTech 0.9 Graduated ND, Hitech 0.9 ND Soft, and 0.6 ND Soft. No HDR! It's been a while since I've been able to take some landscape/coastal shots and I had been itching to get back out with my camera. 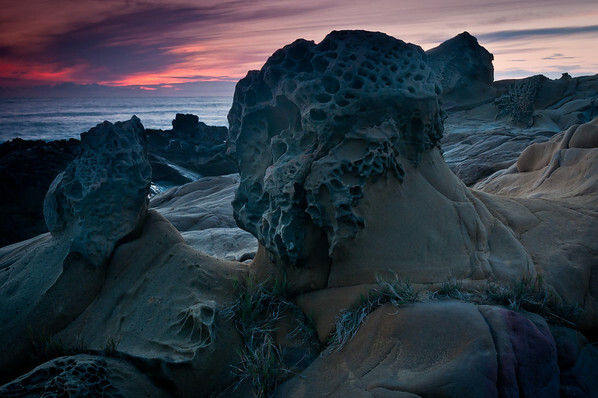 My photo buddy, Willie, noticed that the weather report called for clouds on the coast on Thursday and we packed our camera gear and drove over an hour around the bay and over to Pescadero to stop at one of his favorite beach spots: Bean Hollow Beach. The last time he was here he stumbled upon a Dead Whale that had washed ashore! He managed to take this amazing photo before the crews arrived to bury it in the sand. When we arrived today you could still see part of its carcass above ground. I can officially say I've now touched a whale! We spent a while scouting out places to shoot and I couldn't really find anything I was happy with. 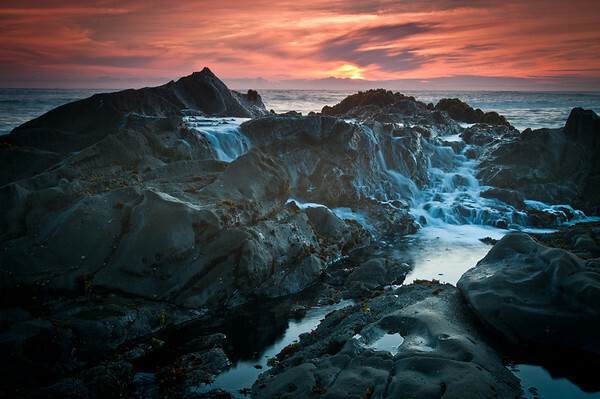 I had found a little tide-pool that I thought would be simple enough and might reflect the sunset colors. I setup my tripod and waited for sunset. The clouds were really far off and we kept praying they'd come closer and give us a beautiful sky -- sure enough we got a great sunset but once the sky lit up I realized my tide-pool was a pretty boring shot with lots of distractions. I noticed that the rocks behind the tide-pool was getting some nice spray so I moved my tripod over to this location and started firing away. After a couple of photos I realized a whole ton of spray had coated my filters and were ruining my shots. Being stupid, I left my micro-fiber cloth all the way on the other side of the rocks and I had to sprint to my camera bag and then sprint back to my camera before it got swept away! Once the filters were cleaned I waited until two big consecutive waves rolled in and managed to get an incoming wave splash against the rocks while the previous wave was still trickling out. Note: very little editing was done to this. I darkened the sky and then had to DE-saturate it so that it didn't seem so fake. Nikon D300s w/Nikkor 17-35mm f/2.8 ED-IF AF-S: 30mm, f/10, 0.5 sec, ISO 125, Tripod Lee Foundation Kit Filter Holder B+W F-Pro Circular Polarizer, HiTech 0.9 Graduated ND, Hitech 0.9 ND Soft, and 0.6 ND Soft. No HDR! 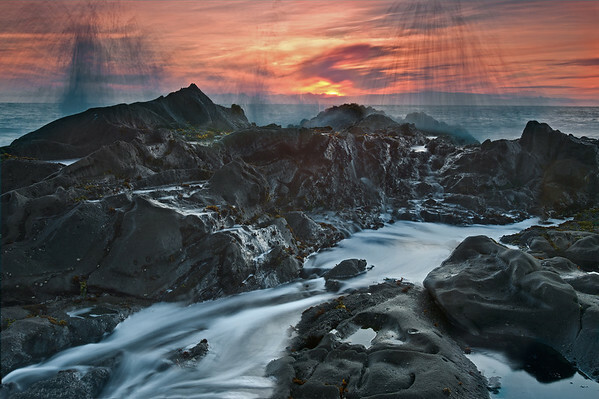 Once I finally found my way over to this neat little spot (after having failed at getting the tidepool shot I had been going for) I cleaned off my dirty filters and waited for waves to crash over these rocks. I liked how the water run-off made little waterfalls on the way down the rocks. Nikon D300s w/Nikkor 17-35mm f/2.8 ED-IF AF-S: 32mm, f/11, 0.8 sec, ISO 125, Tripod Lee Foundation Kit Filter Holder B+W F-Pro Circular Polarizer, HiTech 0.9 Graduated ND, Hitech 0.9 ND Soft, and 0.6 ND Soft. No HDR! After failing at the tide-pool and getting a couple decent shots closer to the water/wave action I decided to try to find a 3rd location. As I made my way over to the other side of the cove I remembered these neat little rocks. I thought I'd try to capture them with the sunset in the background, but unfortunately the color in the sky faded REALLY quickly. I was also trying to line these rocks up so that the 3 of them would create a line that drew the eye through the photo. Unfortunately there was a ledge behind me and I could only move so much before falling off and I couldn't quite separate the middle and right rocks :( Nikon D300s w/Nikkor 17-35mm f/2.8 ED-IF AF-S: 28mm, f/11, 2 sec, ISO 200, Tripod Lee Foundation Kit Filter Holder B+W F-Pro Circular Polarizer, HiTech 0.9 Graduated ND, Hitech 0.9 ND Soft, and 0.6 ND Soft. No HDR!